Convenience stores and supermarkets have had a huge impact on Japan and they play a major role in the shaping of contemporary Japanese culture and lifestyles. And though in many ways it could be said that these stores are helping to bring about the END of TRADITIONAL JAPAN, it could also be said that they are unlikely repositories of certain aspects of Japanese culture , always displaying traditional sweets of the season and never missing a chance to promote and sell foods and other paraphanalia related to traditional events and festivals. The quest for new products to sell has also led to some innovative ideas which have spiced up certain traditional events. 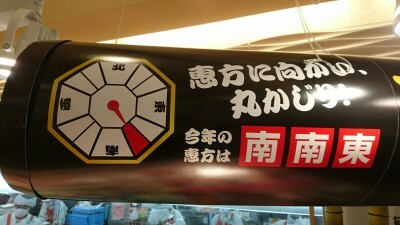 An example of this can be seen if you go to any combini ( convenience store) or supermarket (su-pa) in the 3 or 4 weeks leading up to February 3 , which is the day on which the SESTUBUN festival is celebrated. This poster at a Tsukuba supermarket proclaiming last year`s (2018) “lucky direction” is south by south-east. 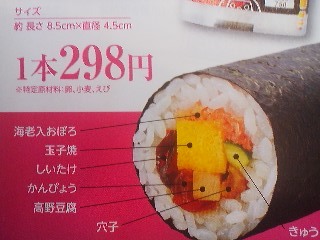 This year (2019) it is north by northeast and that is the direction you should face when eating your Eho-maki this year. 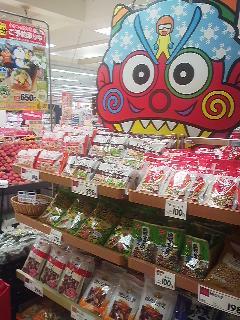 All the supermarkets in Tsukuba have prepared special SETSUBUN CORNERS where soy beans (and peanuts) for throwing are displayed. 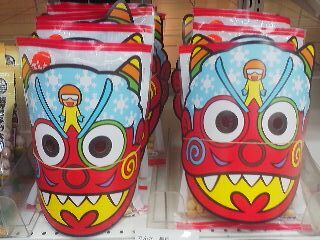 Paper demon masks are sold as well. Sestubun (節分) , is sometimes called the BEAN THROWING FESTIVAL in English. This is because the main feature of the event is the throwing of soy beans , as a way of excorsizing evil and bad luck. 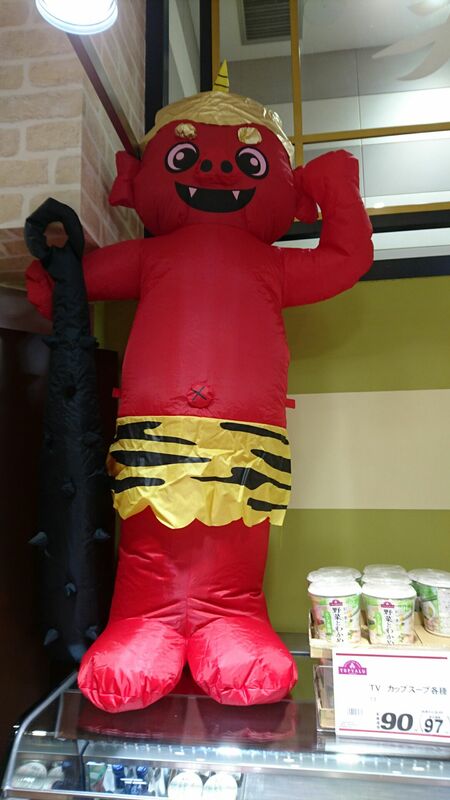 In homes with small children, the man of the house usually dons a paper DEMON MASK (available at combinis and supas) on the evening of the 3rd, and the children proceed to hurl the beans at him crying out – ONI WA SOTO ( Demon out! ). 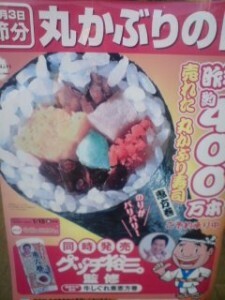 They then continue throwing beans in various directions, shouting FUKU WA UCHI- good fortune in ! Family members then go on to eat the same number of beans as their age. 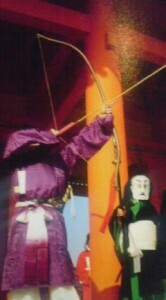 This ritual is called MAME MAKI (bean throwing), and it is also performed at various temples and shrines around Japan. It is usual for adults who are in their UNLUCKY AGES(especially men of 42 and women of 33) to attend these bean throwing events as a form of YAKU YOKE (purification for those of unlucky age). Famous temples and shrines often invite celebrities (sumo wrestlers, movie stars etc) to hurl the beans, and these scenes are often televised. Just watch the news on the night of the 3rd (the night of this year`s mame maki). Many Japanese put these sardine-head amulets at their door-posts on Setsubun. You can see this custom still commonly carried out in Tsukuba`s old neighborhoods – especially Hojo. Nearly all convenience stores and supermarkets have for the past few weeks been displaying a wide array of demon masks and soy bean packages . 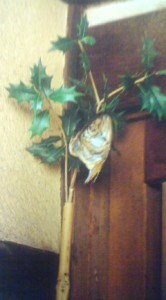 Another custom, though far less popular these days, is the the posting of a sardine head fit onto thorny leaves called hiiragi on the front door. This is done to keep evil and bad fortune away. It is believed that the foul odor of the fish and the uninviting thorns should be effective in keeping any demons OUT. 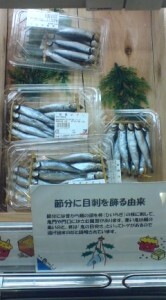 Supermarkets, including the one in the basement of Tsukuba`s Seibu Department Store have been promoting sardines for the making of these protective wreaths. Hiiragi, and especially bean throwing have been the generally accepted, standard ways of celebrating setsubun throughout Japan. However, in recent years combinis and su-pas have been vigorously promoting an ADDITIONAL WAY of celebrating setsubun. Well… at least its new to those who have never lived in Osaka (and other parts of KANSAI ). 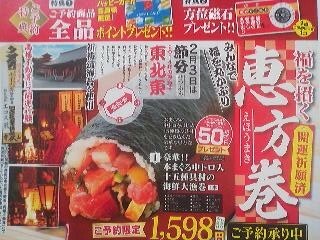 I`m talking of course of the large sushi rolls called EHO-MAKI (恵方巻), which can be seen in promotional posters all over town. These oversized nori-maki (they look like quite a mouthfull) are to be eaten by each family member, in silence, while facing the lucky direction of this year(according to the traditional Japanese almanac). Though most people in Tsukuba had never heard of this ritual until recently, many now reserve their EHO-MAKI weeks before setsubun. More purchase them on the day of the festival. 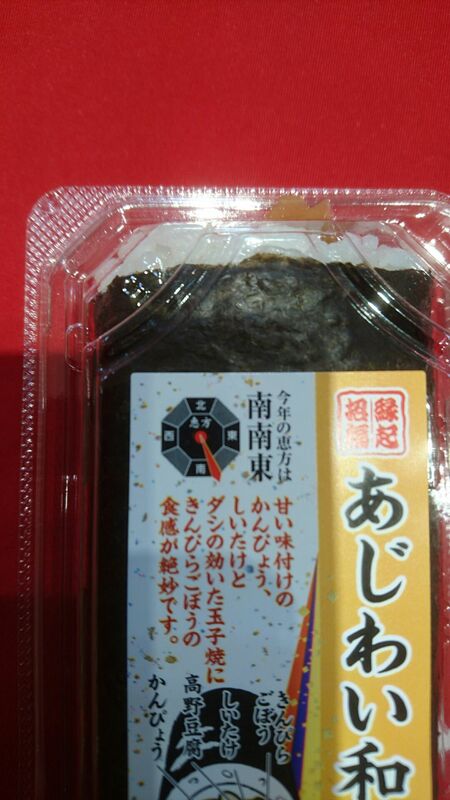 Eating Eho maki while facing the lucky direction ( this year- 2016, it is south by southeast), is in fact a custom, though not very old, which originated(along with so many other great business ideas) in Osaka. Osakan friends living in Tsukuba tell me that they had faithfully eaten their setsubun sushi-rolls every year of their lives, and had imagined that ALL Japanese did the same. Some Tsukubans of Osakan birth used to have Eho Maki sent to them each year by their mothers, before they became available nation-wide. Nobody Ive spoken to could actually explain the significance of the sushi-rolls, but my feeling is that by facing the lucky direction, and slowly and silently taking the EHO -MAKI in, the good energies of this years lucky direction are absorbed by the antennae-like roll. Of course, these sushi- rolls are also chock-full of nutritious fillings (these vary according to price), including egg, seafood etc., to help keep the family healthy through the last weeks (or months!) of cold weather. 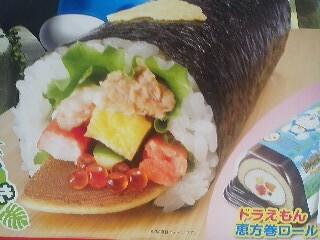 Of course, the most important point for families is that the EHO MAKI are fun and DELICIOUS! Let me tell you a little more about setsubun. This word (節分) in fact means SEASONAL TURNING POINT which then means that traditionally there were four setsubuns in Japan, one for the beginning of each season. Nowadays however, only the day marking the coming of spring is acknowledged by the general public with special rituals. Though it is still quite cold,the first day of spring (rishun) is on February 4th according to the traditional calendar. Before the Japanese converted their calendar to the one used by Europeans, a day began at sunset on the previous evening. 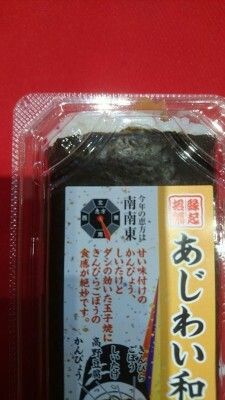 That is why setsubun is celebrated on the evening of the 3rd. This was considered to be the start of the next day- RISHUN. 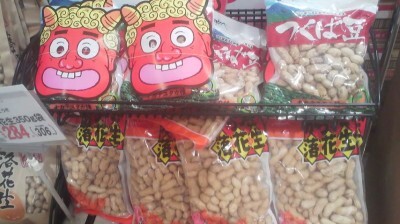 BUN peanuts being promoted by a Tsukuba supermarket. The ancient Chinese believed that these seasonal turning points were times when the world and its inhabitants were susceptible to attacks by evil forces. For protection they would carry out a ceremony which the Japanese call TSUINA( 追儺 ), in which ritual bows and arrows were used to excorsize demons and bad fortune. This ceremony was introduced to Japan as a way of trying to stop an epidemic during the reign of Emperor Mommu (697-707), and during the Heian Period (794-1192), it was carried out anually in the Court, with bow and arrow, on the Traditional New Years Eve. During the Muromachi Period (1392-1573), the use of bow and arrow gave way to the throwing of beans (though some temples, especially in Kyoto, use the old excorsizing techniques), and the custom began to filter down to the masses. Bean throwing on the eve of RISHUN became a standard part of Japanese life in the Edo Period (1600-1868), and remains so to this day. 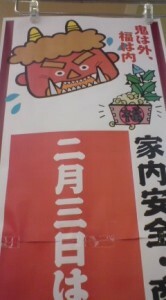 The use of beans is probably related to the DEMON EXTERMINATING CEREMONY (鬼退治の際, oni taiji no sai) held at Kurama Yama , Kyoto. According to a legend, the God Bishamon recommended throwing beans into the eyes, as an effective way of combating demons. Demon Eyes can be written with the characters 魔目(which is read – ma me, a homophone for beans) and this sounds the same as 魔滅、which means DEMISE OF THE DEMON. Also as anyone with an interest in traditional Indian food might know, beans are believed to have special life force powers. Another interesting point is that the reason you eat the same number of beans as your age (and one for good luck) is that before the Japanese calendar changed to the Gregorian, February was the Month of New Years (usually) and thus all Japanese considered themselves one year older (did you know that the money given to children on New Years called TOSHI DAMA, is not New Years money(toshi can mean year) , but AGE MONEY (toshi can also mean age). Thus people celebrated their BIRTHDAY by eating their ages in beans. For seniors who dont want to or cant eat dozens of beans, it is customary to put their age worth into a tea cup, pour tea over it and drink the tea. Eating these beans is also considered to be protection against illness and bad luck. 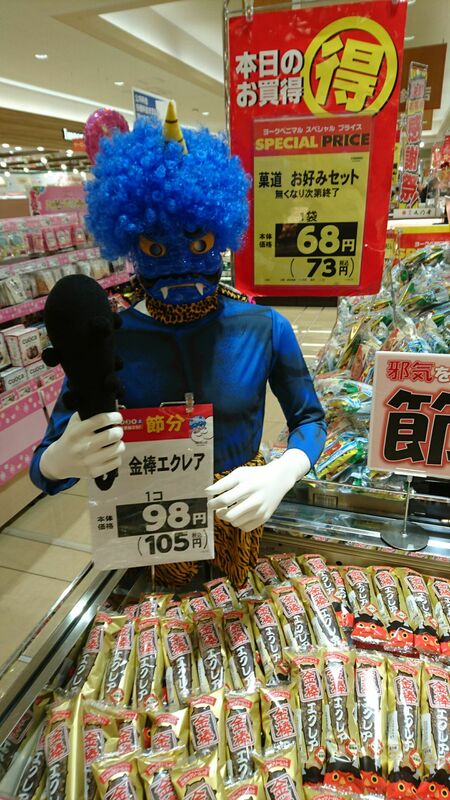 If you would like to celebrate setsubun this year, the convenience store or supermarket will provide you with everything you need. Bean throwing should begin after the sun goes down. A parent puts the demon mask on and goes to the front door. The demon should stand outside and be pelted by the kids who cry ONI WA SOTO.Then throw beans inside the house shouting FUKU WA UCHI !. I once brought a mask and beans with me to New York and did mame maki with my nieces and nephew. It went over very well. If youve got kids, I`d say- give it a try! Thanks for this article! 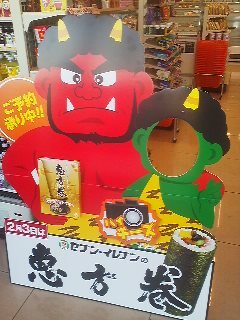 I lived in Osaka for a long time, and my wife is also from Osaka, and when we were getting ready for Setsubun this year we were surprised that the Eho Maki was Kansai-only. All of our other Japanese friends had never eaten Eho Maki on Setsubun, although we had just assumed EVERY Japanese person did it! Woah! I’m 42 this year and my wife is 33, AND its 2013!